This is a classic cross pendant with finely sculpted edges and intricate stampwork. The Spanish influence in the design is apparent. 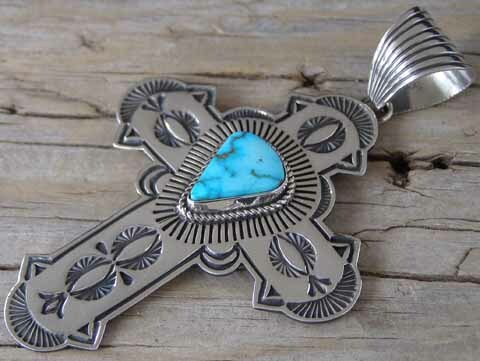 Albert set this with a teardrop of natural, untreated Kingman turquoise from Arizona. Hallmarked A. JAKE on back. Dimensions of cross (excluding jump ring & bale): 2 1/2" x 2"